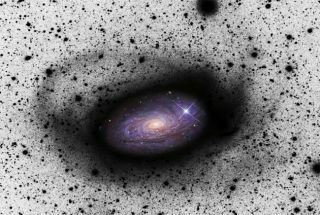 Stellar streams around the spiral galaxy M 63 show remnants of a satellite galaxy that M 63 has swallowed. The central part is an ordinary positive image; in the outer regions, the negative of the image is shown (darker areas show brighter light). In this way, the faint structures that are the target of this survey are more readily discerned. Massive, distant galaxies have been spotted gorging on smallerones to build up their bulk in a far-flung cannibal feast, scientists report. As they are digested, smallerdwarf galaxies are severely distorted, forming structures such as spindlytendrils and stellar streams that surroundtheir captors. These star streams, calledtidal tails, form because of the stronger gravitational pull on the near sideof the small galaxy compared to the far side. Stars closer to the parent galaxyare pulled in more quickly, while stars farther away lag behind. In the new study, the tidal tailswere discovered around spiral galaxies at distances of up to 50 millionlight-years from Earth. The observations were collected by an international group ofresearchers ? led by David Mart?nez-Delgado of the Max Planck Institute forAstronomy and Instituto de Astrof?sica de Canarias in the Spanish CanaryIslands ? working with amateur astronomers using amateur telescopes andcommercially available CCD cameras. The study found that major tidal streams with masses between1 and 5 percent of the galaxy's total mass are quite common in spiral galaxies.The discovery will be detailed in the October issue of the Astronomical Journal.